Have My Lines Been Marked? Your Dig Number identifies specific information about your locate request. It is important that you retain this number as proof of your contact with JULIE. You will need to refer to your dig number if it becomes necessary for you to call JULIE for a second request, refresh or remark at your excavation site. It is now possible to view and print a summary of your Locate Request that includes information about the jobsite address, nearest cross-street, dig start date and time and ticket expiration date. The summary also includes a list of the member utility companies that were notified. A map of the dig site can also viewed as shown below. JULIE locate requests are valid for 28 calendar days including the day of the call. For example, a locate request called in on the first day of the month would last until 11:59 PM on the 28th day of the same month. Excavation MUST begin within 14 calendar days of the initial locate request. However, the 14-day restriction does not apply to any subsequent calls (extend, remark, etc.) on the same dig number. An excavator can extend their locate request ticket between day 20 and day 28 by calling 811 or 800-892-0123. Extended tickets will receive a new 28-day ticket life that starts on the date the extension request was made. Only new/normal locate request tickets can be extended. Emergency, damage, design stage, short-notice and joint meet locate requests cannot be extended. No changes can be made to the jobsite address, extent of work or work type on an extended locate request ticket. A new locate request must be issued if any of these changes are required. Remarks can be added to an extended locate request to specify a certain area be re-marked instead of the entire extent shown on the initial locate request. Extended locate request tickets are considered a request for utility marks unless the caller specifically states no marks are needed. If marks are requested, they require two working days advance notice. Extensions requested within the last two working days of a locate request may delay your excavation project until the facilty owners have marked. Locaterequest extensions maintain the same dig number as the initial locate request for a period of up to 5 months from the initial call. Projects that require a longer period to complete will be issued a new dig number at the end of the five-month period. JULIE’s servers will do a new member lookup during each extend operation to see if there is a new utility line owner near the jobsite to be notified. If weather, construction activity or vandalism erode the markings, a refresh (a request for remarks) is necessary. A refresh request does not extend the ticket life. 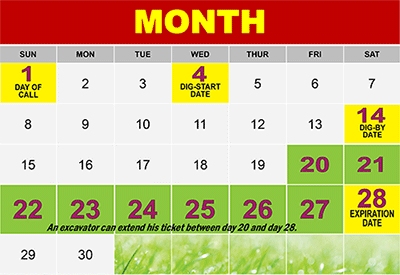 The excavator must specifically request an extension if the project is scheduled to go beyond the 28 days ticket life.